One of the handy things about running a survey through Lattice is that it's easy to share the relevant data with the relevant people. All survey admins can share survey results with others at the company. Surveys results can either be shared in full, or a filtered set of data can be shared. For example, you might want to share the full survey results with the exec team. To do so, navigate to the Results tab of the survey and with no filters applied, click on "Save this view". This will open up the saved views sidebar, and prompt you to give the view and name and name the users that you want to share this view with. You can share the survey results with many people at once. 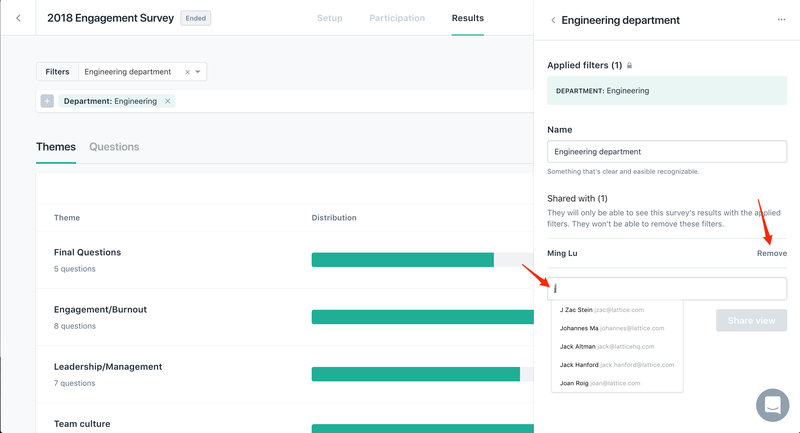 For people outside of the executive team, you might only want to share a subset of the data with them, like sharing the engineering department's results with just the head of the department, or only share results from a manager's team with that manager. To do so, set up the filters to be what you want to share. So in the case of the department head, you would filter on Department = Engineering. Once the filter is set, click on "Save this view" to give it a name and share it with the department head. Note that now, the "Department: Engineering" filter is locked in. The person (or people) who the survey is being shared with will get an email with a link to the results tab (and all its functionality, like the list and heatmap views) with the preset filters locked in. This means that they will not be able to remove the present filters, but they are able to add additional filters when exploring the data. If you want to manage your saved view and who you've shared them with, click on the "Manage views" button to open up the sidebar again. From here you can delete the views you've created, share existing views with more people, or remove people's access to views.